Exercise-induced desaturation is well reported in patients with chronic obstructive pulmonary disease (COPD) . Indeed, some COPD patients do not exhibit clinical resting hypoxemia, i.e. an arterial oxygen pressure (PaO2) less than 55 mmHg, but they do show significant exercise-induced desaturation; these patients have been termed “desaturators” . The six-minute walking test (WT) , a reliable clinical test to explore exercise tolerance in COPD patients, easily detects this desaturation. To correct this desaturation, oxygen is prescribed for desaturator patients to adjust the O2 saturation (SpO2) above 90% during exercise and especially the exercise included in rehabilitation programs. Recently, Bradley et al. reviewed the evidence from single-assessment studies that this ambulatory O2 improves exercise performance in COPD patients but noted that the magnitude of improvement is unclear. The reports on the short-term O2 benefits to these patients during exertion are indeed conflicting; some of the studies mentioned in Bradley’s review reported an increase in exercise performance [4-9], whereas others did not [10, 11]. Moreover, the values of the variables investigated to assess the responses to O2 show great heterogeneity, which could lead to an average benefit that lacks significance. In fact, it may be that in some COPD patients O2 is available to the exercising muscles (because SpO2 is corrected) but is not used, suggesting that the peripheral muscles of these patients are unsuitable for O2 use. Differences in exercise testing protocols, the prescribed flow, and/or disease severity have probably contributed to these divergent results . For example, all the studies that reported a benefit from O2 used an O2 flow that was not individualized in relation to the O2 desaturation but was instead predetermined. As we know that the O2 supply has a dose-response effect , this methodology seems not well adapted and may be far from rehabilitation reality. Moreover, in all the studies that examined the short-term benefits of O2 in COPD, no data were given on the training status of the desaturator subjects. It has been suggested that the exercise-induced desaturation observed during a WT could be linked to muscle characteristics . It is also well known that training can act on these muscle characteristics to improve muscle function , with not only increases in aerobic enzymes and the capillary density of leg muscles , but also a changed breathing pattern with higher tidal volume and lower breathing frequency [14, 15]. As a consequence, after TP, utilization of oxygen by COPD muscle should be more efficient and exercise performance increased. This study thus tests the hypothesis that prior individualized training in desaturator COPD patients will increase acute O2 supply effects on the exercise performance. Twenty-two patients with mild to severe COPD as defined by the Global Initiative for Chronic Obstructive Lung Disease guidelines  were recruited from an inpatient clinic before TP. All were desaturators as they presented significant O2 desaturation during WT, i.e. a fall in SpO2 of at least 4% over 3 minutes . In addition, SpO2 had to be lower than 90% to be qualified for acute O2 supply, i.e. ambulatory oxygen therapy. All patients were stable at the time of the study and no one was treated by long-term oxygen therapy or suffered from clinical cardiovascular, neurological, or any other disease that might have contributed to dyspnoea or exercise limitation. The protocol was explained to each subject and all gave written informed consent. All patients underwent pulmonary function testing including spirometry and lung volumes determined by plethysmography (V6200 Autobox Sensormedics Yorba Linda, CA, USA). Measurements of resting arterial blood gas levels while the patients breathed room air were obtained during a period of clinical stability and quantified with a blood gas analyser (pHOx Plus L, Nova Biomedical, Waltham, MA, USA). All patients performed a cardiopulmonary exercise test (CPET) on an electrically-braked cycle ergometer (Ergometrics 900; Ergoline; Bitz, Germany) following the individualized protocol usually used in our laboratory. On-line calculations of whole-body oxygen consumption (VO2) were averaged sequentially over 15-s intervals and displayed on a screen monitor to observe the progress of the test. Heart rate (HR) was measured continuously throughout the test by 12-lead electrocardiography. The ventilatory threshold was determined using the ventilatory equivalents of O2 and CO2 method . The WT was performed around a perimeter of 31.5 m. Each subject performed two tests to allow the observation of any variability due to “learning”, with a rest of approximately 1 hour between tests. The second test was performed only if SpO2 and HR were identical to the values before the first WT. Patients were asked to walk at their own maximal rate and we retained the greater distance of the two tests. They were asked to cover as much ground as possible in 6 minutes while maintaining a steady rate without running. No encouragement was given, and they were informed each minute of the remaining time. The patients were allowed to stop, but they could start again, if possible, within the allocated 6 minutes. Arterial oxygen saturation (SpO2) and HR were monitored throughout the walk every minute using a pulse oximeter (Nonin 8500 M; Nonin Medical, Inc., Minneapolis, MN, USA). The patients were asked to indicate their level of breathlessness using a visual analogue scale before and immediately after each walk. As there is no official consensus to individualize O2 flow supply according to O2 desaturation during the WT, we used the methodology of our clinic. This methodology has been used for several years and provides good re-saturation with SpO2 equal to or above 90%. When the patient exhibits SpO2 between 90 and 85%, an O2 flow of 2 litres is given. When 84 ≥ SpO2 ≥ 80%, O2 flow amounts to 4 litres. For SpO2 < 80%, O2 flow is 5 litres. O2 flow was via cylinder and nasal specs. All patients participated in an in-patient training program for 4 weeks. The whole-body exercise training included stationary cycling, walking, swimming, and team sports. The exercise intensity was individualized according to target heart rate, i.e. the heart rate at the ventilatory threshold (VT) determined during CPET. This intensity was continuously monitored with a cardiofrequency meter and maintained throughout all exercise. The desaturator COPD patients did not always exhibit O2 desaturation during TP and ambulatory O2 was only used when necessary. For most of the program, in fact, they did not receive O2. Training sessions were held 6 days per week and lasted 45 minutes on average. Training volume per week was 15.1 ± 1.2 h on average and divided in four sessions of stationary cycling (45 minutes per session), three sessions of swimming and team sports (45 minutes per session) and 4 sessions of walking (one or two hours per session). All sessions were supervised by a physiotherapist. Initial assessments were made on admission to the clinic. One to three days after CPET, all patients performed 2 WTs on the same day. The first test (basal WT [BWT]) was performed while they breathed room air. The second test (AIR-WT) was performed while they breathed compressed air. At least one day later the patients were tested during WT whilst breathing oxygen (O2-WT). The O2-WT was performed twice as it is well known that the best performance is generally obtained from the second test. Oxygen flow was adjusted in all patients to reach an SpO2 > 90%. Before each WT, they breathed the gas mixture for 15 minutes. Two indistinguishable cylinders located at the middle of the walking perimeter, one with compressed air and one with O2, were connected to a 15-m tube ending in a nasal cannula. The patients did not know which gas was added. This experimental protocol was conducted by the same investigator before and after TP with the same flow of O2 and compressed air. Results are expressed as mean ± SEM. For each variable of interest, a two-way analysis of variance (ANOVA) with repeated measures was performed. One way was assigned for training condition (before/after) and the other for O2 supply (without/with). When ANOVA detected a significant main effect, post-hoc comparisons were made using a Tukey test. The comparison between the oxygen responder group and the non-responder group was performed using an unpaired t test. Significant differences were declared when p<0.05. Table 1 shows the baseline characteristics of all the patients. The patients present a marked limitation of their aerobic capacity (VO2max = 50.4 ± 3.4% predicted). They had moderate chronic obstruction (FEV1 = 52.1 ± 3% predicted) and mild resting hypoxemia (PaO2 = 67.4 ± 1.5 mmHg). All patients showed clinical desaturation with a mean fall in SpO2 equal to 12.1 ± 1.3% and SpO2 at the end of WT equal to 81.1 ± 1.5%. During the O2-WT, 6 patients required a flow of 2 L, 8 patients required 4 L, and 8 patients required 5 L. O2 administration thus prevented critical desaturation in all subjects and no patient had their SpO2 level fall to < 90% (End O2-WT SaO2 = 90.9 ± 0.6%). Definition of abbreviations: BMI = body mass index; FVC: forced vital capacity; HR:heart rate. Values are mean ± SEM. *: p<0.05 within group comparison before versus after rehabilitation. †: p<0.05 comparison between O2-WT and the corresponding AIR-WT. 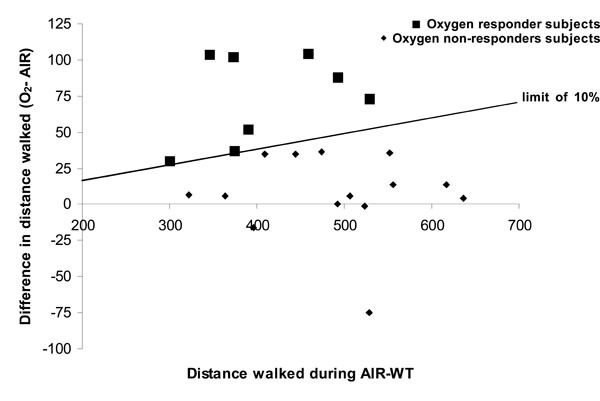 Comparison of the distance walked during AIR-WT versus O2-WT showed a statistically significant effect of O2 on walking distance (Table 2, p<0.05) with no change in HR at the end of WT. This increase in walking distance was associated with a significant effect of O2 on dyspnoea (p<0.05), which was 6% lower at the end of O2-WT than at the end of AIR-WT. No effect of O2 on HR at rest or at the end of WT was observed (Table 2). Nevertheless, high variability was noted in the O2 response. In line with the literature, we considered the patients who increased their walking distance by at least 10% while breathing oxygen to be oxygen responders (see Methodological considerations in the discussion). Thus, compared with AIR-WT, during O2-WT 14 patients showed no improvement in exercise tolerance and 8 patients increased their walking distance (18.2 ± 2.7%, i.e. 74 ± 10.8 m on average) (Fig. 1). No basal parameter predicted the occurrence of O2 benefits during O2-WT. However, oxygen responders seemed to have greater disease severity than non-responders (FEV1 = 46.8 ± 4.9% predicted vs 53.7 ± 3.5% predicted, respectively) as well as lower exercise tolerance (distance walked during AIR-WT before TP: 407.5 ± 27.5 m vs 487.2 ± 24.6% predicted, respectively p<0.05). Individual data on walk distance on six minute walk test (WT) after breathing compressed air or oxygen. Endurance capacity, measured as an increase in the distance walked during WT, improved significantly after 4 weeks of training (458.2 ± 20 m vs 512.4 ± 20.3 m; p<0.05) for the entire population. The mean gain was 13.2% after training, or 54.5 ± 12.9 m. Dyspnoea at rest and at the end of WT was significantly decreased after TP (p<0.05). TP had no significant effect on HR at rest or at the end of WT (Table 2). The benefits of TP on exercise tolerance were the same in oxygen responders and non-responders (distance walked by oxygen responders increased by 67.4 ± 29.5 m and by non-responders, 46.6 ± 12.2 m). After TP, the same O2 flow allocated before TP was used. On average, O2 inhalation during WT increased the distance walked statistically but not clinically, compared with AIR-WT (512.4 ± 20.3 m vs 538 ± 19.9 m, respectively; p<0.05). O2 significantly decreased dyspnoea at the end of O2-WT(-9.3% between dyspnoea at the end of AIR-WT and dyspnoea at the end of O2-WT; p<0.05). Despite the greater distances covered, HR was not modified by acute oxygen supply, before or after WT. Individual responses to O2 supply varied greatly. After TP, when patients breathed O2 during WT, 6 increased their walking distance by > 10% (18.7%, i.e. 73.1 m on average) but 16 showed no improvement. When we compared data before and after TP, only 4 patients who were able to increase their walking distance with O2 before TP had also improved their walking distance after TP. Thus, 4 patients who were oxygen responders before TP became non-responders after TP. And 2 patients who were oxygen non-responders before TP became responders after TP. Again, no baseline characteristic allowed us to predict either situation. Compressed air administration did not modify the results of the basal test in any patient. Walking distance during BWT was 415.4 ± 27 m and 419.5 ± 24.3 m, which corresponds to a 1.5% difference. The main result of this study reported that, despite the clinical benefits of TP, a prior TP did not optimize the acute effect of O2 supply on desaturator COPD patients during a walking test. We also confirmed that the responses to O2 supply of COPD patients show wide disparity during exercise. Choice of exercise.The 6-minute walking test has been validated for the detection of therapeutic improvements in exercise tolerance and dyspnoea. It thus has been widely used to show that O2 supply during exercise can improve tolerance [4, 5, 18]. Walking was reported to be associated with the lowest mean SpO2 value when saturation was measured during several daytime activities . In addition, WT is more sensitive to desaturation than other tests like cardiopulmonary exercise testing on cycle ergometer , and it provokes breathlessness. It thus appears to be a functional test well adapted to evaluating patients in their own daily surroundings. Protocol for O2 supply.Contrary to other studies which gave a pre-determined FIO2 to their patients during exercise, we individualized the O2 flow on the basis of the desaturation observed at the end of AIR-WT. This ensured that each patient reached a SpO2 ≥ 90%. The O2 supply protocol described above is regularly used in our institution and personal observation confirms that this individualized protocol effectively prevents desaturation during exertion. In our study, all our patients kept their SpO2 ≥ 90% during WT (SpO2 = 90.9 ± 0.7% at the end O2-WT). Oxygen response.Studies on O2 supply and its benefits always present their results as averages. A few recent studies have focused on the heterogeneity of these results. However, none have determined the threshold above which the increase in walking distance thanks to O2 supply is clinically significant. In the literature, the variability between two WTs is less than 10% in many chronic diseases [20-24]. Moreover, Eiser et al. observed an 8% variability between the WTs of COPD patients. We thus assumed that a variation above 10% should not be considered as variability but as clinically significant modification. Our study demonstrated that before TP O2 inhalation significantly increased the exercise tolerance of desaturator COPD patients. Several studies [5, 8, 26] have described improvements in the dyspnoea index and exercise performance when O2 was administered only during exercise. Some [8, 26] also noted difficulties in predicting the response to O2. In our study, no basal or WT parameter (especially exercise-induced desaturation) reliably predicted the response to O2 supply during exercise. Nevertheless, disease severity and exercise capacity before TP tended to be lower in the oxygen responders. On average, our patients presented moderate chronic airway limitation (FEV1 = 52.1 ± 3% predicted) and Fujimoto et al. showed that patients with moderate severity (FEV1 > 50% predicted) did not improve exercise capacity to the same extent as did patients with more severe disease, indicating that O2 supply during exercise might be useful only in patients with moderate to severe disease. Somfay et al. demonstrated that O2 supply during exercise induced dose-dependent improvement in endurance and symptom perception in COPD patients. In our study, we used a low O2 flow, which was nevertheless individualized. It is possible that in these conditions, the response to O2 during exercise is less remarkable and not so clinically significant. But in our case, we observed the real effects of acute O2 supplementation as it is prescribed in medical institutions. Most studies have reported a wide range of individual responses to O2, as did ours. It must be emphasized that the effects of hyperoxia are multifactorial and involve many integrated mechanisms. During O2 breathing in this study, the end O2-WT heart rate was similar to air-WT despite the greater distances covered by the patients. In addition, acute O2 supply significantly reduced perceived dyspnoea at the end of WT. Jolly et al. suggested that cardiovascular limitation could be implicated in the response to O2 during exercise. Moreover, in addition to the diffusion limitation in the lung, a diffusion limitation at the level of the skeletal muscles may be present . Supplemental O2 may thus fail to enhance muscle O2 utilization during exercise in COPD patients with peripheral muscle weakness . One hypothesis to explain our heterogeneous responses is thus that in hyperoxic conditions, the above-mentioned mechanisms are involved but to different degrees in each patient. On average, the response to O2 supply during exercise was not modified by TP. Although we observed an effect of O2 after TP on walking distance and dyspnoea, the combination of prior TP and acute O2 supply during exercise had no cumulative effect on the exercise tolerance of COPD patients who present exercise-induced desaturation. TP was, however, efficient in increasing exercise tolerance. Indeed, after training, the distance walked during WT was statistically and clinically increased and dyspnoea was significantly decreased with a heart rate at the end of the WT similar to that before TP. These results confirm the beneficial effects of individualized training on exercise tolerance in COPD patients. Exercise training induces cardiovascular benefits (with a gain in spontaneous baroreflex sensitivity)  and pulmonary benefits. Casaburi et al. demonstrated more efficient exercise breathing patterns and lower ventilation (with increase in tidal volume). TP also produces changes in skeletal muscles (increased oxidative metabolism activity and mean fibre area) [13, 30]. In summary, TP improves exercise tolerance by inducing central (cardiopulmonary) and peripheral (peripheral skeletal muscle) adaptations. The success of O2 supply is also likely to depend on its net effects on cardiopulmonary and peripheral muscle functions . As no cumulative effect of TP plus acute O2 supplementation was seen, we can hypothesize that the training modalities of our TP led to central adaptations but could not be adjusted enough to induce peripheral adaptations. More resistance training in this TP would probably induce peripheral adaptations more efficiently since little demand is placed on the cardiopulmonary system  during this type of exercise, making it well tolerated by COPD patients. But possibly we did not observe a greater response to O2 after TP because the effects of TP far exceeded the acute effects of O2. Many factors account for the absence of a cumulative effect of training and O2 supply during exercise. The contribution of exercise-induced desaturation to exercise limitation is still uncertain, and the mechanisms by which O2 affects exercise tolerance are complex. The present study confirmed previous reports that showed that the acute effects of O2, as well as the effects of training, do not correlate with lung function parameters or blood gas values at rest or during exercise [4, 33, 34]. Furthermore, in the present study, the acute effects of O2 did not predict the effects of training in individual subjects. Hence, patients with a poor response to O2 are not necessarily poor candidates for training. These findings suggest that oxygen and training may influence exercise tolerance by different mechanisms. In summary, this study confirmed the great heterogeneity in responses to O2 supply during exercise, with approximately 35% of our COPD patients improving their exercise tolerance. The training program did not modify this response to O2, suggesting that efficient O2 utilization does not depend on muscular and central benefits of TP. Moreover, basal parameters and exercise-desaturation do not seem to be reliable criteria for selecting those patients who will most benefit from O2 during activities. As the response to this therapy is unpredictable, every patient should be individually evaluated. Poulain M, Durand F, Palomba B, et al. 6-minute walk testing is more sensitive than maximal incremental cycle testing for detecting oxygen desaturation in patients with COPD Chest 2003; 123(5): 1401-7. Turner SE, Eastwood PR, Cecins NM, Hillman DR, Jenkins SC. Physiologic responses to incremental and self-paced exercise in COPD: a comparison of three tests Chest 2004; 126(3): 766-3. Bradley JM, Lasserson T, Elborn S, Macmahon J, O'Neill B. A systematic review of randomized controlled trials examining the short-term benefit of ambulatory oxygen in COPD Chest 2007; 131(1): 278-85. Davidson AC, Leach R, George RJ, Geddes DM. Supplemental oxygen and exercise ability in chronic obstructive airways disease Thorax 1988; 43(12): 965-71. Dean NC, Brown JK, Himelman RB, Doherty JJ, Gold WM, Stulbarg MS. Oxygen may improve dyspnea and endurance in patients with chronic obstructive pulmonary disease and only mild hypoxemia Am Rev Respir Dis 1992; 146(4): 941-45. O'Donnell DE, D'Arsigny C, Webb KA. Effects of hyperoxia on ventilatory limitation during exercise in advanced chronic obstructive pulmonary disease Am J Respir Crit Care Med 2001; 163(4): 892-98. Jolly EC, Di Boscio V, Aguirre L, Luna CM, Berensztein S, Gene RJ. Effects of supplemental oxygen during activity in patients with advanced COPD without severe resting hypoxemia Chest 2001; 120(2): 437-. Fujimoto K, Matsuzawa Y, Yamaguchi S, Koizumi T, Kubo K. Benefits of oxygen on exercise performance and pulmonary hemodynamics in patients with COPD with mild hypoxemia Chest 2002; 122(2): 457-63. Somfay A, Porszasz J, Lee SM, Casaburi R. Dose-response effect of oxygen on hyperinflation and exercise endurance in nonhypoxaemic COPD patients Eur Respir J 2001; 18(1): 77-84. Dewan NA, Bell CW. Effect of low flow and high flow oxygen delivery on exercise tolerance and sensation of dyspnea.A study comparing the transtracheal catheter and nasal prongs. Chest 1994; 105(4): 1061-5. Longo AM, Moser KM, Luchsinger PC. The role of oxygen therapy in the rehabilitation of patients with chronic obstructive pulmonary disease Am Rev Respir Dis 1971; 103(5): 690-7. Casaburi R, Porszasz J, Burns MR, Carithers ER, Chang RS, Cooper CB. Physiologic benefits of exercise training in rehabilitation of patients with severe chronic obstructive pulmonary disease Am J Respir Crit Care Med 1997; 155(5): 1541-51. Maltais F, LeBlanc P, Simard C, et al. Skeletal muscle adaptation to endurance training in patients with chronic obstructive pulmo-nary disease Am J Respir Crit Care Med 1996; 154(2 Pt 1): 442-7. Vallet G, Ahmaidi S, Serres I, et al. Comparison of two training programmes in chronic airway limitation patients: standardized versus individualized protocols Eur Respir J 1997; 10(1): 114-22. Casaburi R, Patessio A, Ioli F, Zanaboni S, Donner CF, Wasserman K. Reductions in exercise lactic acidosis and ventilation as a result of exercise training in patients with obstructive lung disease Am Rev Respir Dis 1991; 143(1): 9-18. Rabe KF, Hurd S, Anzueto A, et al. Global Strategy for the Diag-nosis Management, and Prevention of Chronic Obstructive Pulmonary Disease GOLD Executive Summary Am J Respir Crit Care Med 2007; 176(6): 532-5. Wasserman K. The anaerobic threshold definition physiological significance and identification Adv Cardiol 1986; 35: 1-23. Leach RM, Davidson AC, Chinn S, Twort CH, Cameron IR, Bateman NT. Portable liquid oxygen and exercise ability in severe respiratory disability Thorax 1992; 47(10): 781-9. Soguel Schenkel N, Burdet L, de Muralt B, Fitting JW. Oxygen saturation during daily activities in chronic obstructive pulmonary disease Eur Respir J 1996; 9(12): 2584-9. Andersson C, Asztalos L, Mattsson E. Six-minute walk test in adults with cerebral palsy A study of reliability Clin Rehabil 2006; 20(6): 488-95. Kervio G, Ville NS, Leclercq C, Daubert JC, Carre F. Cardiorespiratory adaptations during the six-minute walk test in chronic heart failure patients Eur J Cardiovasc Prev Rehabil 2004; 11(2): 171-7. Montgomery PS, Gardner AW. The clinical utility of a six-minute walk test in peripheral arterial occlusive disease patients J Am Geriatr Soc 1998; 46(6): 706-11. Opasich C, Pinna GD, Mazza A, et al. Reproducibility of the six-minute walking test in patients with chronic congestive heart failure, practical implications Am J Cardiol 1998; 81(12): 1497-500. Roomi J, Johnson MM, Waters K, Yohannes A, Helm A, Connolly MJ. Respiratory rehabilitation exercise capacity and quality of life in chronic airways disease in old age Age Ageing 1996; 25(1): 12-6. Eiser N, Willsher D, Dore CJ. Reliability repeatability and sensitivity to change of externally and self-paced walking tests in COPD patients Respir Med 2003; 97(4): 407-14. Woodcock AA, Gross ER, Geddes DM(1981). Oxygen relieves breathlessness in "pink puffers" Lancet 1981; 25(1(8226)): 907-9. Wagner PD. Algebraic analysis of the determinants of VO2, max Respir Physiol 1993; 93(2): 221-37. Gosselink R, Decramer M. Peripheral skeletal muscles and exercise performance in patients with chronic obstructive pulmonary dis-ease Monaldi Arch Chest Dis 1998; 53(4): 419-23. Costes F, Roche F, Pichot V, Vergnon JM, Garet M, Barthelemy JC. Influence of exercise training on cardiac baroreflex sensitivity in patients with COPD Eur Respir J 2004; 23(3): 396-401. Montes de Oca M, Torres SH, Gonzalez Y, Romero E, Hernandez N, Talamo C. [Changes in exercise tolerance health related quality of life and peripheral muscle characteristics of chronic obstructive pulmonary disease patients after 6 weeks' training] Arch Broncopneumol 2005; 41(8): 413-8. O'Donnell DE, Bain DJ, Webb KA. Factors contributing to relief of exertional breathlessness during hyperoxia in chronic airflow limitation Am J Respir Crit Care Med 1997; 155(2): 530-. Richardson RS, Sheldon J, Poole DC, Hopkins SR, Ries AL, Wagner PD. Evidence of skeletal muscle metabolic reserve during whole body exercise in patients with chronic obstructive pulmonary disease Am J Respir Crit Care Med 1999; 159(3): 881-5. Light RW, Mahutte CK, Stansbury DW, Fischer CE, Brown SE. Relationship between improvement in exercise performance with supplemental oxygen and hypoxic ventilatory drive in patients with chronic airflow obstruction Chest 1989; 95(4): 751-6. Rooyackers JM, Dekhuijzen PN, Van Herwaarden CL, Folgering HT. Training with supplemental oxygen in patients with COPD and hypoxaemia at peak exercise Eur Respir J 1997; 10(6): 1278-84.